Commonly called as Dodka, this vegetable is cooked and if fully ripened, it turns out loofah to scrub body. 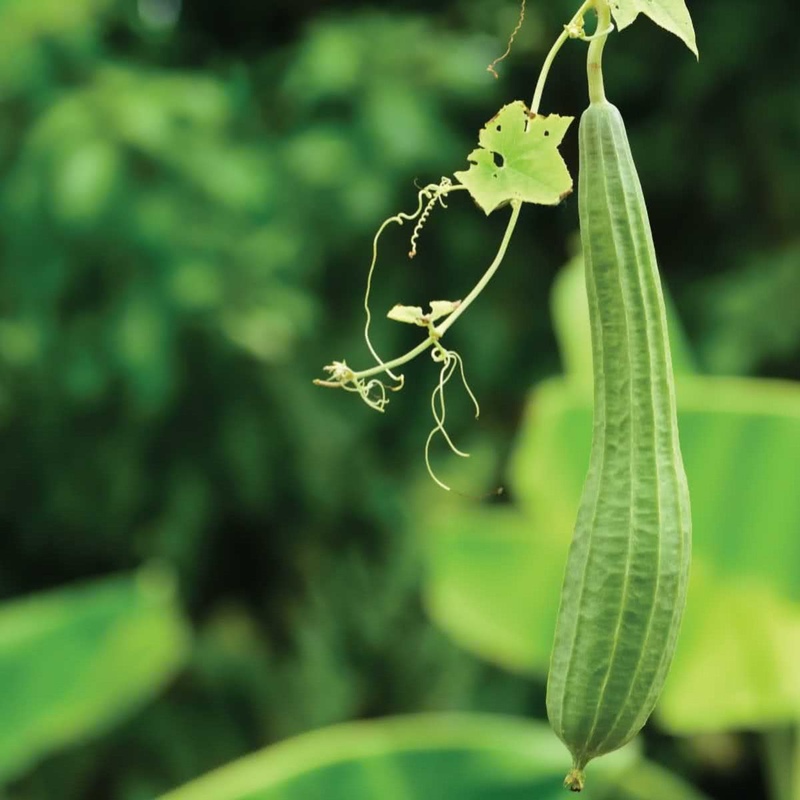 Introduction and Uses: Ridge Gourd is extremely high in dietary fibre and vital vitamins and minerals like vitamin C, Zinc, Iron, Magnesium, Thiamin and Riboflavin. It aids in weight loss as it is pretty low in saturated fat, calories and cholesterol. This different looking vegetable also contains Peptides and Alkaloids that help in regulating the sugar levels in blood and urine. Sowing Season: Monsoon & best grown in summer. Sunlight: Ridge Gourd plants require full sunlight. Therefore your raised bed should be made at a bright sunny spot. Keep the Ridge Gourd container under open sunlight. Watering: Water your potted Ridge Gourd plant every day in summer. Water the soil near the plant. Use a watering can to make sure that the plants get water in the form of the shower & not by a single flow. You can also make provision for watering by watering by drip irrigation system for your raised beds. Trellis: Ridge gourd is an aggressive climber & needs plenty of space to grow. So develop a strong trellis support up to height of 5-6 ft, by using locally available material like pipes, bamboo, ropes, wires etc. 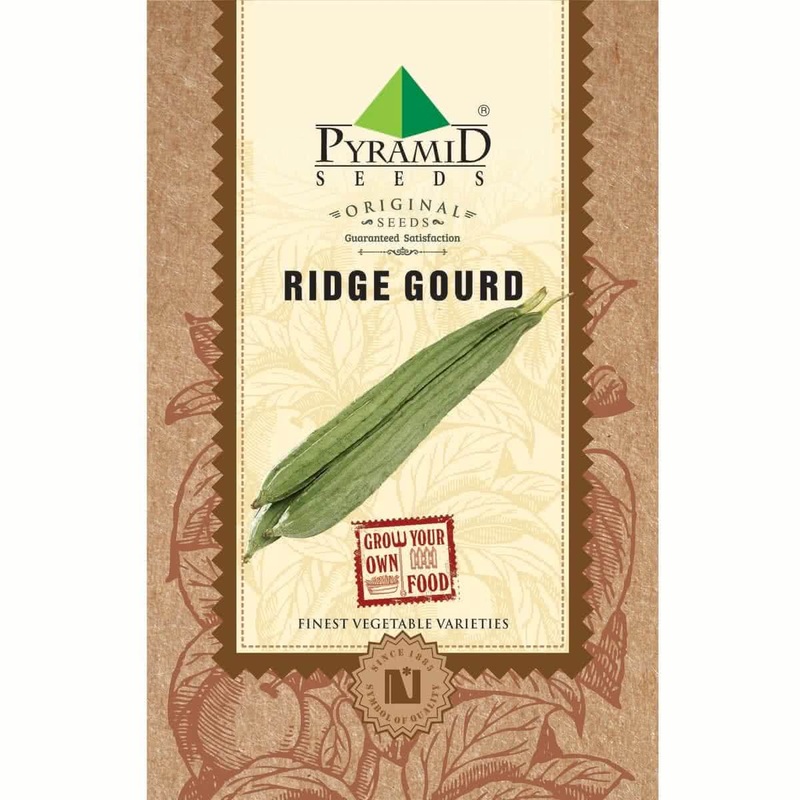 for your Ridge gourd plant. Read about trellis support ideas. Top Dressing: When the Ridge gourd climber is more than 45 days old, provide one tablespoon of 15:15:15 (NPK) Fertilizer per plant or mix handful of Vermicompost in the soil around each plant. Hand pollination of flowers: Take ‘pollens’ from male flowers on painting brush or cotton bud & dust them on ‘stigma’ of female flowers. This will increase overall production of Ridge Gourd. This step is not mandatory. Note: Ridge Gourds have separate Male & female flowers on same plant. Fruits will be formed on female flower after pollination. Harvesting: (80 to 90 days from sowing.) Ridge gourd climber will start flowering at the end of 3rd month. You can start harvesting ripe Ridge gourd fruits after 3 months of seed sowing. Harvesting season can continue for next 3 months. Approx. 18 to 20 Seeds in 2.4 gm, 157 to 175 Seeds in 25 gm, 630 to 700 Seeds in 100 gm, 1575 to 1750 Seeds in 250 gm.